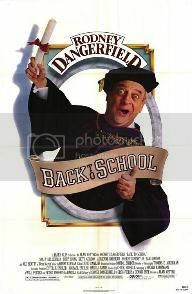 Useless Trivia: Back to School was directed by Alan Metter, whose resume also includes Police Academy: Mission to Moscow (1994). • Early in his stand-up career, Dangerfield worked as an aluminum-siding salesman to help make ends meet. • Kinison's grave reads, "IN ANOTHER TIME AND PLACE HE WOULD HAVE BEEN CALLED PROPHET". Rumored to be the first comedy ever to make more than 100 million at the box office.